UNSCRIPTED NEW YORK not only celebrates the BEST improvised theatre, we also showcase fully improvised film & video! We are devoted to improvisational theatre and film that seeks to tell a story. Read more about our Mission here. 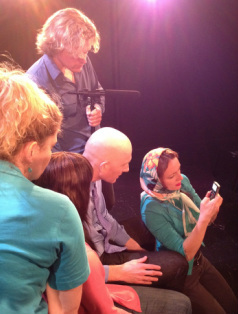 Read a review of our 2012 Improvised Film show here. Our improvisational actors come from all across the U.S. and Canada to share a love for working without a script and creating without a net. Our Film/Video Submission Period is now closed. Please stay tuned for updates on our festival schedule! DON'T FORGET - WE NEED VOLUNTEERS! HOW TO GET INVOLVED. Any questions? Please email us at unscriptedfest@gmail.com! CHECK OUT OUR IMPROVISED VIDEO FROM 2012 FEST! "IT'S NOT REALITY -- IT'S ACTUALITY"